Congratulations to our latest WomensNet.net Amber Grant Winner, Lea Richards. WN: Congratulations on winning the March Amber Grant! LR: Thank you so so much! This is amazing! WN: Where did the idea for Pig of the Month come from? LR: I had just left my job in finance, and moved back home to try and figure out the next step. Father’s Day was coming up, so I ordered ribs from a competitor for my Dad. When they came we were so disappointed by the quality of the meats and presentation that my dad remarked that I could do a better job — so, we researched it a little bit, and gave it a go! 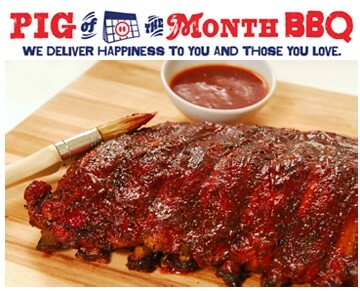 We named it Pig of the Month since you can get all sorts of different kinds of piggy products delivered to you every month. WN: How did you find others to get involved? LR: It’s grown very organically. I’ve hired people that I have come across during normal business activities. For instance, our sales guy used to be our FedEx rep – he impressed me so much that I just knew I had to have him on board. Hiring is tough, so if you see someone in action that impresses you it never hurts to ask them to join you. WN: We know that you emphasize customer service. Talk about how you make your customers feel appreciated. LR: I think it’s very important to make every part of an interaction with your company a positive, memorable experience. We use custom shipping notifications that are really funny, along with custom shipping labels to make even the mundane more fun. When customers call us we always answer with a smile, and since we only have 2 people doing customer service, they typically remember you and ask about your family, the weather where you are, etc. to make the customers feel like they really are a part of our family. Every little thing counts! WN: How do you plan to change the way this generation looks at food? LR: I think we need to move away from mass produced foods with unrecognizable ingredients to whole foods that are made fresh. We’re doing it through the products we sell, and the informational videos and blog posts we do on our site as well. It’s important to us that we make sure our customers know why our products may be a little more expensive, but a lot better for them. Let’s get rid of the preservatives and nitrates once and for all! WN: What advice would you give to other women who are interested in starting their own business? LR: Just get started! The hardest part of starting a business for me was taking all the research and information from courses, etc and actually putting it into action. Once you get going though, you can easily test every element of your plan out and see what actually works for you. Don’t compare your success with anybody else’s – this might be their 3rd attempt, or 4th year in business. You never know the backstory, and its not fair to compare your middle to their end – it will only leave you feeling bad.